Lately, I’ve been thinking a lot about time. 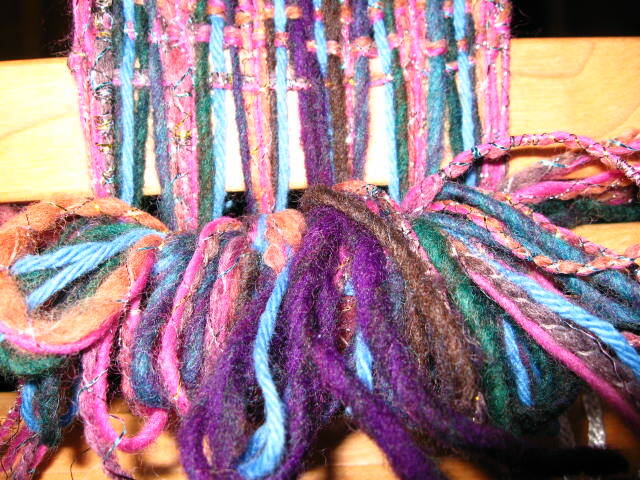 I have been spending a lot of time on what I enjoy (spinning, weaving, knitting), but I don’t have much to show for it. And instead of feeling happy and productive, I actually feel harried and frantic at the moment. I’m learning that, as a fast-paced person, creating things quickly in order to finish sooner if it’s at the expense of quality costs more in the long run. When I started spinning, I was in a hurry to have something to knit. So I did spin about a dozen skeins of yarn. But the more I spin, the more I learn about spinning. And the more I learn about spinning, the more I want to spin to improve. The funny thing is, even though I finally have enough handspun, I haven’t knit any of it. I want to learn to spin the best that I can, which will take the time that it takes. There was an uneasy equilibrium to the spin/knit/time equation, but bringing home two looms has really jumbled things up. Weaving is now monopolising my thoughts. 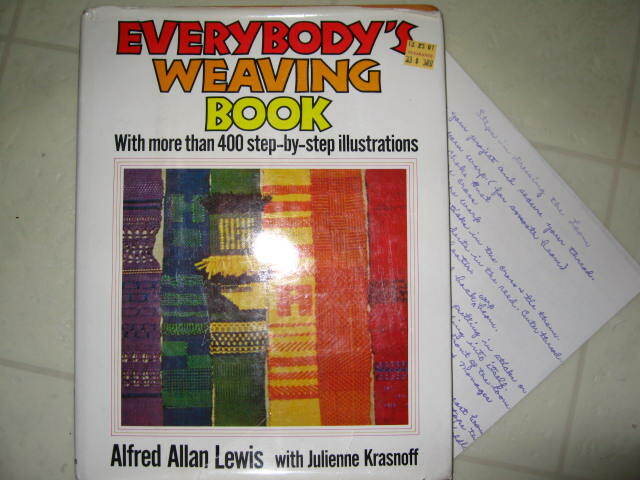 I’m obsessed with learning about the parts of my loom, how to tie it up, how to weave, and what those diagrammes of little square grids mean in weaving pattern books . Everything else is on hold as I figure out how to pull myself out of the abyss of knowing nothing about weaving to a point where my thoughts may have enough coherence to know where to start. I know this is temporary state of discomfort, but I usually don’t weather that gracefully, and I know I make my family and household slightly anxious with my stress . I realised two things. First, that I’m really lucky to have such a great husband. He rarely stopped me from diving off the deep end into anything I’ve become interested in. (Until these recent indiscretions, I’ve been mindful of the budget.) Mostly just asked me to pace myself at times when the budget was tight, but raised eyebrows and skeptical “harumph!”s are usually the worst of it. That leads to the second thing: I’m finally paying the price of squirreling away more than I can process. There is no room to bring in Beauty. (For example, I unearthed two sets of bongo drums in my office that have been forgotten for more than two years when I was sure my eighteen-month old showed aptitude as a drummer.) My beautiful loom, sitting outside, unused. I think I can clear enough space by the end of summer, if impatience doesn’t kill me first. And this also came in. I don’t remember seeing where it was recommended, but I thought that for about five dollars (including shipping), it was worth a try. It’s a little musty smelling, but I hope an outside sunny airing for a few days will take care of that. It’s a fantastic starter book with lots of very clear pictures. It even came with some previous owner’s notes (a purple-coloured ditto copy!) about dressing the loom, and study questions (with answers!) 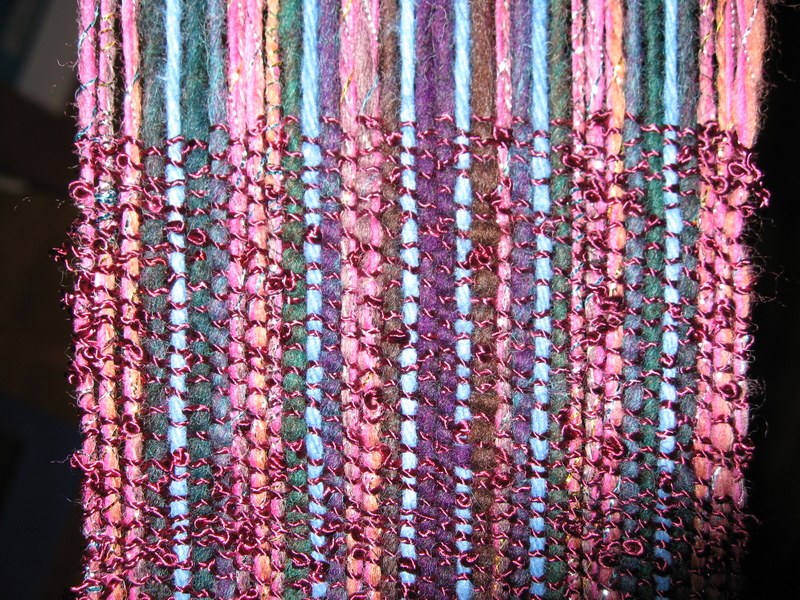 from Mary Black’s “New Key To Weaving” (Beauty came with that book). And I just love the connection to the past, continuing the thread. I didn’t leave the Weaving Works empty-handed. This is the new 2008 edition, which you can find from Fine Fiber Press. I’ve read on other blogs that it had been out of print at least twenty years, and some being sold on eBay were going in the hundred-dollar range. I spent a few hours on Friday trying to find more cording for tie-ups. It might be a little difficult to see, but the coin is a dime. The top is an example of the string heddles I have. They are 9-1/2″ heddles, probably hand-tied. I have a lot of these, and they seem uniformly sized to me. I though that when the time came, I could probably make some of these up myself, using a board with nails at the appropriate lengths. The woman at Weaving Works confirmed that, with an additional tip: use headless nails. But, apparently they also sell Texsolv heddles already at the right length, although I have no idea about the price. 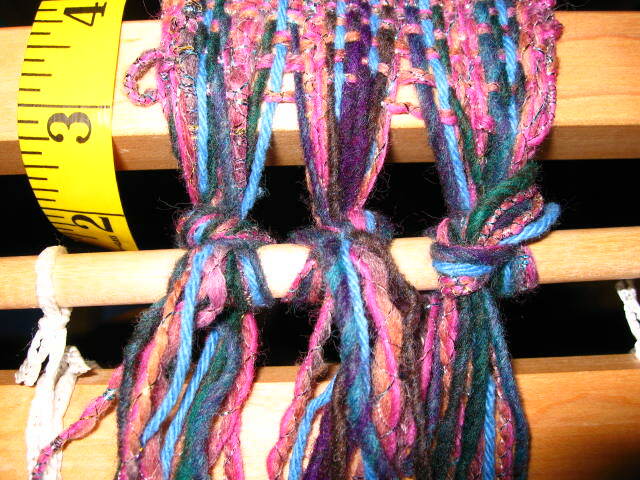 But I wonder if it would make a difference, mixing up two different kinds of heddles. The middle cord is slightly thicker, and is the cording attached to my jacks in the castle. 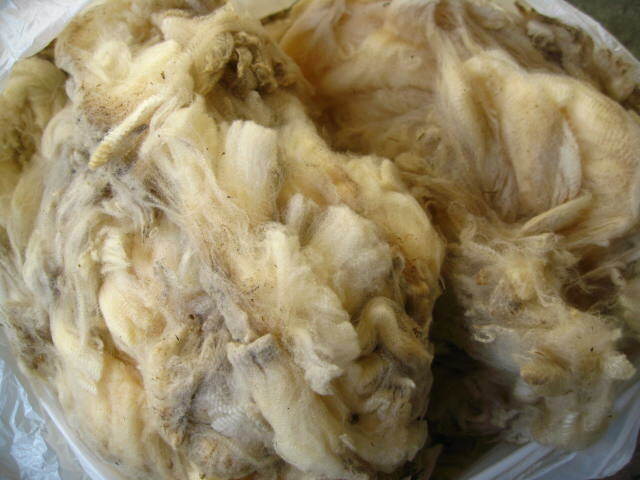 The lower cording is the thickest of all — it’s used only on the lamms. It’s a woven cord, not plied. 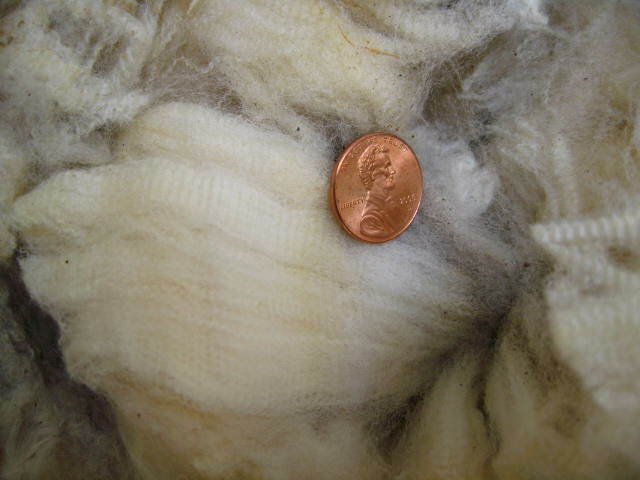 Since I don’t have any extra cording to connect the lamms to the treddles, I spent a lot of time trying to find more. Unsuccessfully. Now I understand Trapunto’s lament on the difficulty of finding a natural cording (for friction and grip when tying knots) that is also thick, dense, and not stretchy. (She thought linen would be great.) I thought this cording is like clothestring line, but the only ones I could find (hardware stores) are nylon, slippery, and not the right thickness. This cording looks almost like round shoestring lace, but thicker. I’ve never tried a lucet before, but I wonder if this kind of cord can be produced on a lucet. I completely forgot to look for linen to spin while at the Weaving Works, but I can see this might be in a future spinning queue. 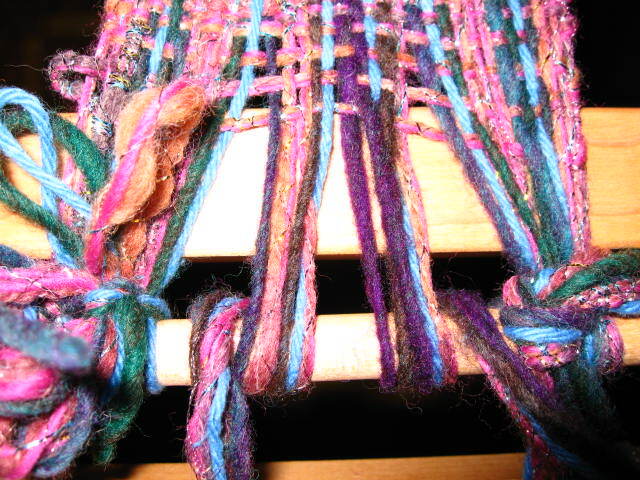 When I started this post, I was feeling so down about my loom ouside/messy inside situation. But, on proofing this for publication, I’m trying not to laugh. How could you possibly feel my pain when all these wonderful new things come pouring in, and even I no longer feel my pain?! Have you seen the movie “Persuasion”, with Amanda Root and Ciaran Hinds? There’s a scene in it when Anne’s sister Mary, who is an exasperating hypochondriac, earnestly implores Anne: “You must help me convince them how very, very ill I am!” Well, I’m feeling a lot better now. My loom will make it indoors somehow. 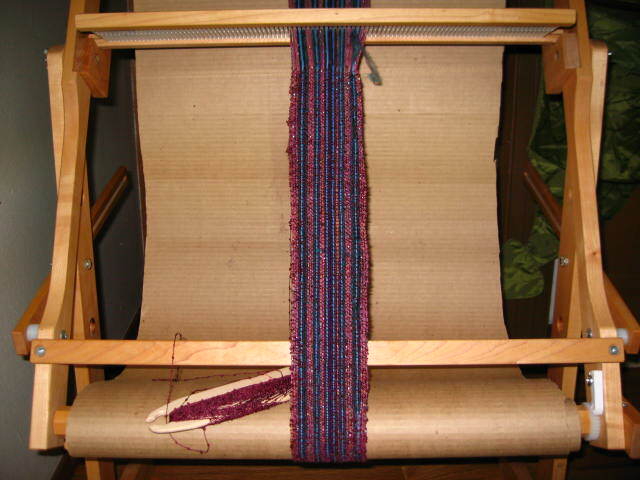 This morning, I sat down to weave for the first time. This was really fun for me because I didn’t have to do any warping preparation. For seasoned weavers out there, this post will be tedious, but if you make it to the end of the post, I welcome any comments to help me improve! 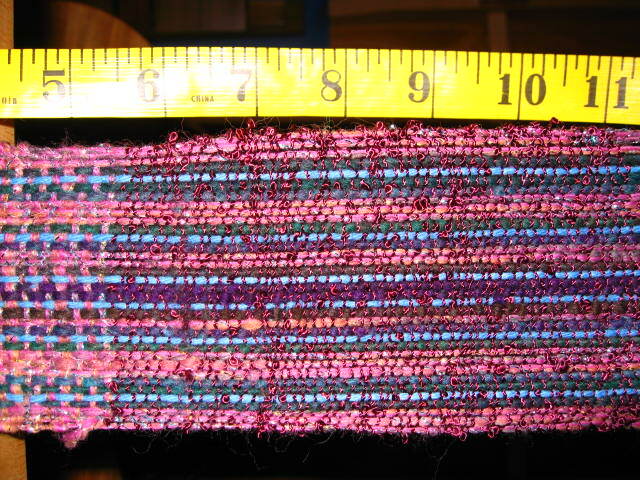 You can definitely tell where the original weaving left off (at the 7″ mark) and I began. 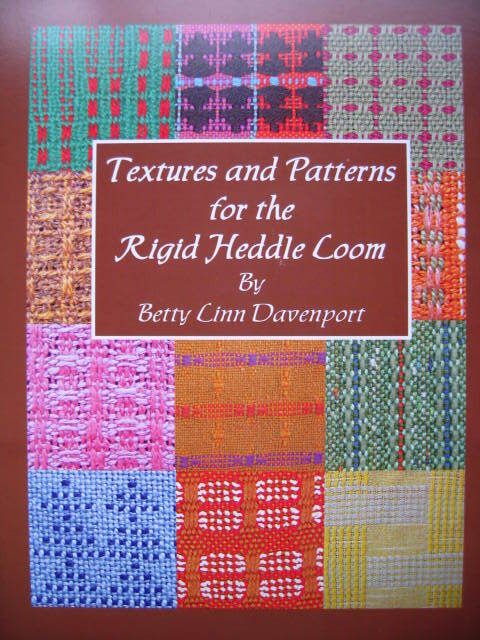 It seemed so easy watching Betty Linn Davenport do it in her RH Loom video, but even following her tips for creating a clean, even selvedge, mine were still messy. Then there was the matter of getting used to the beater. The word “beater” is a bit misleading, because I didn’t have to beat at all, and even the gentle “beating” I’ve done is obviously too heavy-handed. 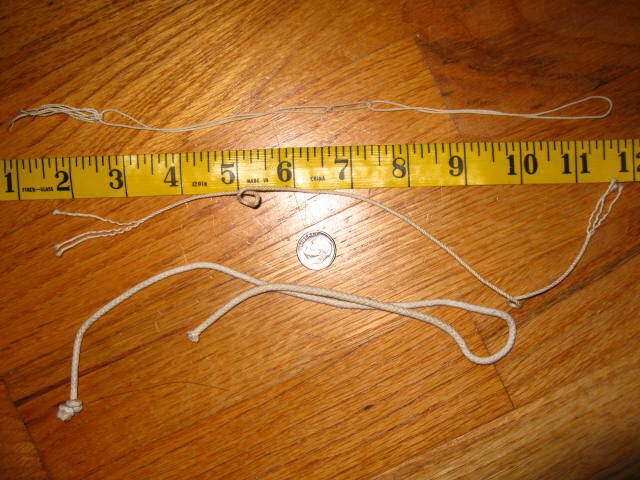 The picture may not be be the best, but the weft yarns definitely slants down on the edge nearest the tape measure. I decided to re-tie the ends to help improve the weave. The original tie-up in three bunches. First bunch has been untied and re-tied. Second bunch shown untied. I like Betty Linn Davenport’s way of tying up with a bow; it was a pain undoing the knots used before. Here are the three original tie-ups separated and re-tied into six. The new tie-ups helped straighten the left side somewhat; I obviously have other problems to sort out, and I need to practise beating more gently. What a pleasant start to my day! I can’t wait to finish this practise piece and start my own project. I thought I would use Lily Sugar ‘N Cream cotton to weave dishcloths as a first project. 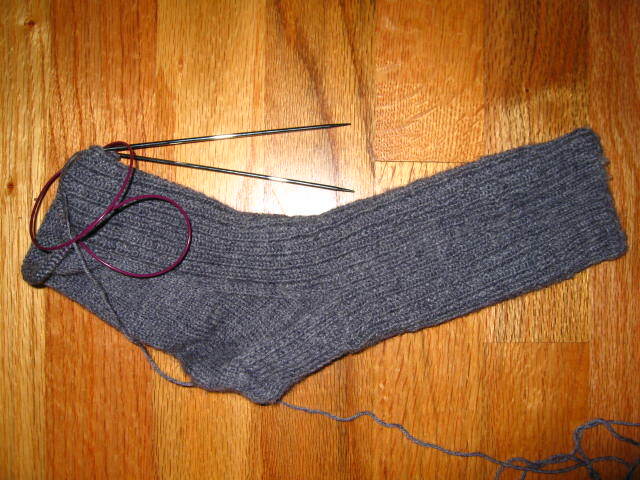 On another note, I actually did some knitting today — first time in three months! My son was invited to an ice-cream party to celebrate today’s being the last day of public school. So, with all the children entertaining each other (and the other mothers knowing my eccentricities well by now), I got in some quality knit time.